Yes, EVM (Earned Value Management) is tough and I rarely see organizations following it as taught by PMI since there is not a lot of info on it and the terminology can confuse executives. Key thing is to ensure you can follow the basic concepts of EVM. Every PM should be able to answer these questions at any time (have the answers in your back pocket). If you don't have a software that helps manage this, then create an excel spreadsheet and collect, track, monitor, trend and forecast this valuable data. 1) Are we ahead or behind schedule? 2) How efficiently are we using time? 3) When are we likely to finish work? 4) Are we under or over our budget? 5) How efficiently are we using our resources? 6) What is the project likely to cost? 7) Will we be under or over budget? 8) What will the remaining work cost? Then also, start to use the formula SV = Planned Time (PT) minus Elapsed Time (ET), then this can help when you are more focused on time vs money. Note: This is Part 2 and is a continuation of Part 1 (previous blog post), which defined and illustrated Functional vs Projectized organization designs. We need to understand "Styles of Organizational Design" that exist since they directly impact how easy it will be to manage projects. The organizational structure of a company and also of a project must both be clearly documented, communicated and understood by all project stakeholders. An organizational structure defines how employees interact, relate, communicate and express levels of authority. This will enable the stakeholders to manage expectations and also identify risks of the project due to the type of design that exists. Functional Manager – specializes in a specific area of the organization and the general management skills required to execute on the associated operational goals, manages resources by following operational management practices. Project Manager – has a general understanding of all aspects of general and project management, manages projects and people by following project methodologies and project management practices. Organizations can generally be grouped into three types of organizational structures. All resources report into a Functional Manager (focused generally on an Operational Aspect of the Business). This type of design is most prevalent in larger, older, more established organizations. This design is also known as hierarchical. 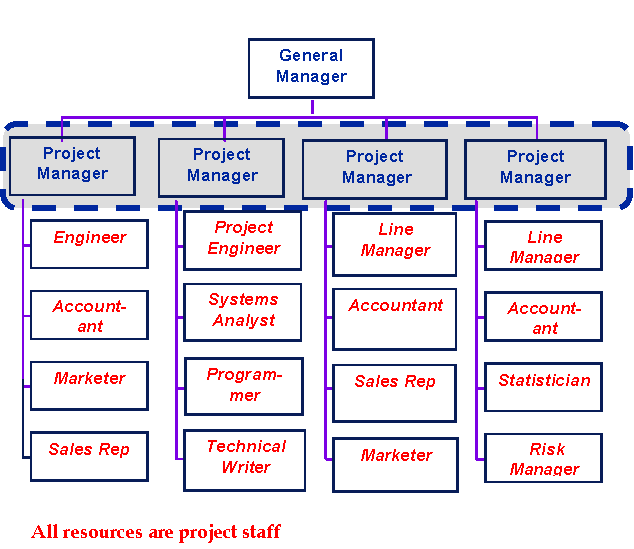 All resources report into a Project Manager. 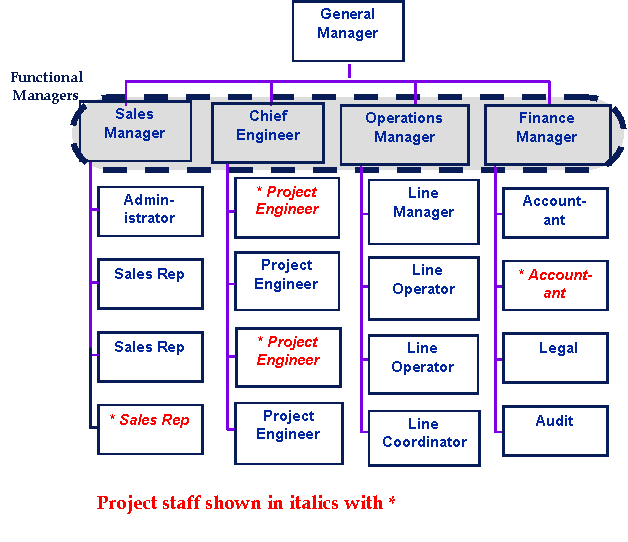 This design has project staff separated from other departments and only grouped in accordance with projects. If not on a project, employees may be placed within Human Resources temporarily with a focus on professional development (or also known as “on the bench”). The third type of Design is the Matrix Design and can be described as "somewhere in the middle between Functional and Matrix". The Matrix blends aspects of both designs and thus can also be called Strong Matrix (closer to the Project Concept) or Weak Matrix (closer to the Functional Concept). It is generally identified by having a "project management office" where all the PMs report into. Resources still report into a functional manager but it is formally recognized that parts of their capacity are managed by the PM and the PM has a level of authority over the resources (e.g. the PM takes gives input that impacts a resources performance review or bonus, etc). NOTE: check out the next/upcoming Post - Organizational Design & PM Interactions Part 2 of 2 to see the Advantages vs Disadvantages of the types of organizational design structures. Social Media tools are actively becoming part of PM Systems. PM softwares must be able to chat, post, timeline, monitor, track, interact, exchange documents, dashboard goals/objectives & deliverables and do all of this in "real time". And of course, the PM methodology must establish all processes that the software follows. Often we think Microsoft Project is a PM Plan type of tool, this is not the case. Yes, it is a powerful Schedule Management tool, but a true PM tool must have the functions mentioned above, similar to the Social Media World software packages. Key functions of Social Media softwares are: communicate, communicate, communicate! Essentially, with this function, you will have your finger on the pulse of the project, you will know how it "feels" vs getting a weekly report that stays within the tunnel vision of the template. The more you communicate the faster you are able to transition from green, to yellow, to red and back and forth. You understand so many complexities of the project that you are actually able to not panic and address issues as they pop up, and then get back to the baseline plan (or incorporate a change that gets you back on the path of the baseline plan). Too often, a risk or issue occurs, and the first thing that has to happen is the team has to get up to speed on what is going on. Not good. NOW, on the other hand........Social media does also have some detriments, it does not often have clear objectives and ability to track and stick to them. Lots of time can be spent but is all over the place, so is difficult to justify business value. So if incorporating tools into the PM system, ensure that risk is addressed head on (many easy ways to do so). Social Media concepts & discussions are plentiful in a website created by a pioneer in the Virtual World (check out how many posts he actually has - in the Thousands.... WOW). His name is Darren Cannell. He uses technology to enable knowledge transfer (education and training) and is all about online communication . OR, if want to spend the time, research his blog and you will find that he shares a 30 Day process on creating social media presence. If can't find all the parts in his blog, then contact him direct, he loves to share his knowledge. Does a Weekly Report bring value anymore? Is there still ROI? People do not like to document when things are going to go bad, OR have already gone bad. People will generally not tell the entire story, and often only put minimal levels of details (is there really anyone out there that likes doing status reports?). So why do we hound, beg, threaten, and plead for weekly reports to be submitted on time and within the requested format or template? In our project consulting company we are leveraging what the world has now embraced - We use a simple "Social Media" concept software module. It allows for short, simple, fast, Project Updates - posted any time from any device to audiences that you can customize. The processes allow for posts to be shared about specific projects in a timely, accurate and transparent manner. The KEY is to keep it short, simple and regular. This tool now helps to keep a finger on the pulse (you now know how the project "feels") and thus can raise the flag early if need be. This helps the project manager not have to chase everyone to get their weekly report in. Essentially, weekly reports are not needed, however, we still need to use monthly reports for EVM details and schedule/gannt chart software for work progress details. The daily posts we are getting seem to have a much higher ROI then weekly reports. Waiting to the end of the week also seems too long since things happen so fast in today's business environment. People can now be more collaborative and react quicker and they also seem to enjoy "chatting about the project" in a more informal manner. PS: If you want to try a free demo contact Darren.cannell@nexlevinc.com or at least try some different approaches and let us know what you think or how it worked for you. We create many types of reports & communication mediums. Break it down to: SENDER - MESSAGE - RECEIVER. Then go from there. Make sure the communication tool is directly related to the type of information, audience and influencers present. Don't over complicate and over administer it, humans have a short attention span and love to complicate things ;-) If creating reports, then simplify them where possible, differentiate between technical detailed reports and status/update reports (much more common). type of information (reports, updates, memos, meetings, change, issues, formal documents, emails, etc).